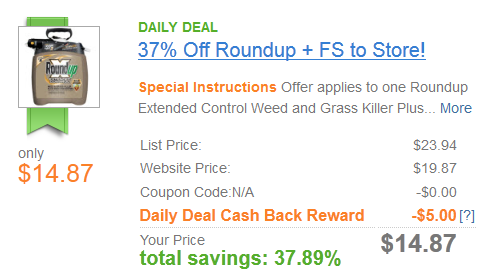 Beth Ann & Jessica's Helpful Savings: Shop at Home: 37% off RoundUp at Lowes with Free Shipping! Just $14.87 After Cash Back. Shop at Home: 37% off RoundUp at Lowes with Free Shipping! Just $14.87 After Cash Back. Must be a member of Shop at Home to get this daily deal (sign up below or click here).